Having successfully built a 4-voice crOwBX I decided the only logical thing to do next was to build an 8-voice. Given that there was no dedicated thread for the 8-voice I thought I might start one. I intend to put whatever pertinent info I can find into this for those who might also want to build one for themselves. I'd also like to solicit the advice of anybody who has already taken this project on. Do you have the board set for this? I saw an eight voice backplane on Crow's Shopify site, but no eight voice controller. Does that exist yet? Or does one use two four voice controllers? Do you have any intel as to when the new voice boards will be offered? Yes, I have all the requisite boards and have begun populating the voice boards, which are the most time-consuming. Not sure I understand your 2nd/3rd questions. For this, I will use the host board that comes with the 4-voice board set, 8-voice backplane, and 8 voice board/slot adapters. For control, I will be using Peter Kvitek's MidiGal (x1) and Midi2CV boards (x2). I'm not sure when the revised voice boards (e.g. - the ones that don't require the slot adapter) will be available. The slot adapters don't require too many additional parts so not a big deal to me. I was referring to the host board. Obviously I have never built one of these, sorry for the wrong descriptor. My interest is in trying to resurrect a decrepit, trashed eight voice OB-X. I have ordered the cards and am patiently waiting for them to be made. May i ask what you used for the 19v power supply for your 4 voice and how you housed it? Also what was roughly the end cost of the entire 4 voice, i'm fairly new to the Diy game so its just out of interest, i see the boards are $175US, what did the psu, housing and components roughly come to? Four-voice is roughly 1500usd all in. I thought I'd chime in. I've built 12 voice cards, 4 to expand my OB-X, and 8 to build an 8-voice. The cards are finished, as is the backplane, and I'm working on a host board. I intend to put the host board voltages under microprocessor control, with the goal of MIDI CC control of most parameters. It's cool that all of you have completed yours. Every time I want to start my crOwBX, I get frustrated while working on the BOM. It makes me want to throw all my synths and Rhodes in the attic and under the proverbial front porch steps/crawlspace and wait 30 years. I have eight voice cards plus an 8 voice backplane on order with a plan to do an integrated 8 voice system. Curious what you guys are planning to do for for power. For a 4 voice I would get and modify a Power-One HAA15-0.8-A for 19V, but that won't be enough for an 8 voice. I was looking at alternatives, like maybe a Power-One HCBB-75W-A or even a beefy Power One HDD15-5-AG. 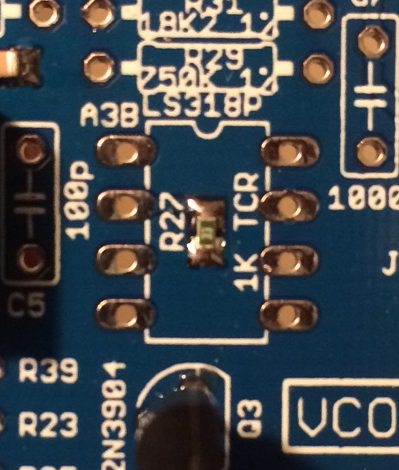 I haven't looked in detail at the mod, but I am assuming that some resistors in series with the trimmers are brought down lower bu adding a parallel resistor, has anyone done this with a bigger supply? I have a working 4voice crowBx, fairly early version with slot adapters etc. I have other fish to fry tho at the moment, and also despite numerous attempts I haven't had any replies back from crow. 1. It sounded like there were going to be redesigned voice cards using the newly re-released 3310s soon - is this still in the works? I'd love to add this to my backlog but I'm not sure what I need to order to get there. I haven't heard any updates about this either, and I do not know what board version are currently on sale in the 4 voice January configuration. This was/is confusing to me too. I ordered two sets of the "crOwBX bare four voice board set - January 2018 pre-order", and then one set of "crOwBX Eight-voice Backplane Bare PC Board - September 2017". I have no idea if this is the right thing to get, so please don't blame me if you do the same and it's wrong. I took a leap of faith, but at the very least I would think this should get me eight voice cards which is all I really want, thinking I can wing everything else one way or another. Note that the 8 voice back plane only shows up if you click on the "CATALOG" top menu. I haven't received anything yet so I'm not much help unfortunately. Christopher Scott Rider is the crowbx 8 voice available? Are those new voice cards without hosts? Compatible with the old ones? The only complain with my crowbx is the 4-voice limitation so adding 4 more and maybe a better user interface board (=preset memory) would make it as versitile as DDRM, what do you think? ...and you would discard the 4-voice backplanes along with one of the host boards. I ordered the slot-adapter-less voice card board sets but received the normal voice boards with slot adapters. Scott clarified that the revised voice boards were not ready (as of a few months ago when my board sets were ordered/delivered) and there was no ETA (something about needing tweaking, I deleted the email). The slot adapters are a only a minor inconvenience and I'm impatient so I forged ahead. So far I've got 8 voice cards ~50% complete. I've taken only a cursory look at potential power supplies. Once I decide what I'm going to use I'll list it here. Great! Thanks for the info jim. Another thing unclear to me is the LS318 situation. Most of what I read about in old threads are years old, but I am assuming that the TO-78 package is still the way to go? Or maybe the January 2018 batch will have a SOIC-8 footprint too? You can get the LS318 in DIP form which the board is designed for. Using the DIP chip allows your tempco to be in direct physical contact with the chip. A little thermal compound will help. Do NOT socket the LS318. Oh wow! According everything I have read they took the PDIP footprint out of production back in 2013, but it looks like they are now back in stock!? Makes things easier - thanks! How close does this come to the original Oberheim. I'm so tempted but it will be me first big project. Is it a exacting clone? Also what are people using for a case and panel for this ? How close to an original I cannot say. What I can say is that I'm 100% satisfied with the sound and functionality of my 4-voice and only want for more voices (ok...and a multi-mode filter). I build my own cases. Front panel will be a modified version of the one available on Crow's site. I'm also building an 8-voice. looking forward to oldcrow finishing a new host board etc. Any word yet on when the January 2018 pre-order will ship? I tried emailing oldcrow a while back but got no response. Can't help you out with specifics but Scott has, in my experience, always shipped immediately after receiving delivery from the pcb manufacturer. I have ordered some of these too and am still waiting. Would be nice to hear from Scott on this, I wouldn't doubt if the Chinese new year has something to do with the delay. Thanks for the info! I've tried to read almost everything I can online about this project, if there is somewhere else where updates are more frequent I am happy to follow along there. I ordered a 4 voice kit, but I am interested in eventually building 8 voices.